The latest SWL construction update from FB. This one includes some pretty irrelevant conversation, but it's still fun and gives us some good views of the action. Thanks for the notes, makes it so much quicker to get to the good stuff. RE 1:55, it looks like that big open area will be a hangar and the y shape on the ceiling (and other framing below) will eventually look like the angled walls in the attached picture. Last edited by mcstewart37; 07-12-2017, 04:32 PM. Good call about the angled supports. I could definitely see those supporting the angled ceiling in the hangar bay. Of course, they could be smaller than what's seen in the movie since the ride will likely have to rely on forced perspective to make the hangar seem even larger than it really is. I could see a portion of the ride sending guests through a hanger and the opening will simply be a big screen making it seem like you are looking out the back of the building out toward the planet surface or even into space if the ride makes you feel you left the planet momentarily. I would be surprised if they started the ride from a hanger scene as this would seem too similar to Star Tours. Just a thought though I doubt it to be the case but what if Disney surprised everyone and part of the BE building will actually house Star Tours and they will announce three not just two major attractions at the opening of SWL? ST is a very compact ride and the packaging of it makes it an easy ride to place anywhere. We already know it will......they showed it to us. I would love this, but I give it about 1% change of actually happening. Haha I totally forgot about that concept art! And I wasted how much time finding just the right screencap from one of the movies! I find it ridiculous that Disney would use 14 acres for an entire land and only give it two rides. Disneyland does not have that kind of land to just waste on two attractions. Even if they don't announce Star Tours as another ride, I'll be upset if they don't throw in a third or fourth attraction. As it stands, there will just be TWO attractions, already heavily discussed here. MODELS and Presentations at the D23 Expo will provide answers to a lot of questions, but will also provide details leading to new questions. Imagineers may be able to provide answers to some of those. I think discussions here will take a different focus, from on-site videos to D23 revelations. Drop that by 1% and you'll be spot on. The circular "room" at the front will probably be the means of getting from the "base" to the ship. Maybe like the Millennium attraction. Revolving pod or ship that provides video of the flight, like the old Mission to the Moon/Mars. I seem to recall a Micechat article that mentioned a power struggle between Anaheim and Orlando regarding the possibility of a third ride. At the time, Team Disney Anaheim and Team Disney Orlando were going back and forth, with Orlando only wanting 2 rides for Star Wars Land and Anaheim wanting 3. According to Micechat, because of the One Disney strategy, both coasts couldn't have what they want, and Anaheim was forced to abandon this third ride that would have been open from the outset. Indeed, there is still room for future expansion, but who knows if that will ever happen when other areas are much more in need of TLC. I really hope the Battle Escape ride makes minimal use of screen technology. I'm not sure what I was expecting before seeing this vehicle, but if the ride relies on screens to tell the story as we move through the sets, it will be just like Gringotts or Spiderman at Universal in Florida. Still, I think Disney will come through and really blow us away. That's incredibly unfortunate. 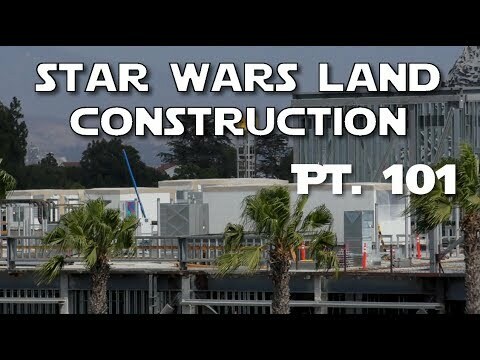 I'd hate to see Star Wars land get an expansion in the future, however. 14 acres is plenty of space to include a new ride in even if it's at the cost of shops, restaurants, and meet and greets. Land is too valuable at Disneyland and that expansion space just north east of Star Wars land, along with Toon Town and the Fantasyland theater, should all go into a brand new land of its own, or even a Frontierland expansion. MiceAge Disneyland Rumor Update – New Lands, New Bosses, New Legacy. Didn't the announced 14 acres include the land for expansion to the east of the planned Millennium Falcon attraction? I vaguely remember that being part of the 14 acres? Even if not, there definitely seems to be some room within the land that could be absorbed for future attractions. Also, it would make no sense financially for Disney to open the land packed with attractions/rides to the brim. By opening it with two, they will still get an enormous bump in attendance anyway. The land will still be seen as a huge expansion with only two rides. Then several years down the road, they can open a new ride/attraction and be able to market it to pull a bump in return / new visitors again. At the end of the day, it's all about $$ - for better or worse. Cars Land has only (barely) three rides and it seems to do alright. I think the Battle Escape attraction will eat lots of people, since it will be such a long ride. Just imagine how many of those ride vehicles can travel through the immense show building at the same time. The Millennium Falcon attraction is more of an unknown. However, while it's true that SWL will start with only two rides, that may change and I think it's shortsighted to ignore all of the other items of interest included in the land. It will definitely have at least as many shops, eateries and shows as Main Street ever had - even when all of the shops were stiff open. I agree. Though looking at the model it does appear they are building the land with some of the space pre-designed to act as a place holder for possible future attractions that can be input with minimal disturbance to the land itself. I see them getting up to 3-4 in the land within 5-10 years of opening. They are definitely exploiting the popularity of the SW IP with fans on this one and milking it.